COLD SOULS is constructed around a single original premise: that it’s actually possible to remove the soul from your body and keep it in storage until a later date. With your body ‘de-souled’ you’re no longer burdened by pesky emotions, you feel lighter and you think more rationally. Of course, like any medical procedure there are certain side effects. Paul Giamatti (playing himself) is struggling with the titular character in a production of Uncle Vanya and when he reads an article about a place dealing in ‘soul storage’ he investigates whether this is the answer to his troubles. Once his soul has been removed he’s surprised to discover it resembles a small chickpea. What should have come as no surprise however, is that being soulless isn’t exactly a great way to live. He picks a new soul out of a catalogue, one that used to belong to a Russian poet and though it greatly helps his performance, once the play wraps he decides to have his original put back in. Unfortunately, his chickpea-soul has been stolen. Director Sophie Barthes’ debut has a lot going for it: great premise, beautifully shot and a fantastic performance by Paul Giamatti. It’s also often quite funny, particularly early on when we’re still adjusting to such a service existing (Paul looks up the clinic under ‘Soul Storage’ in the Yellow Pages). 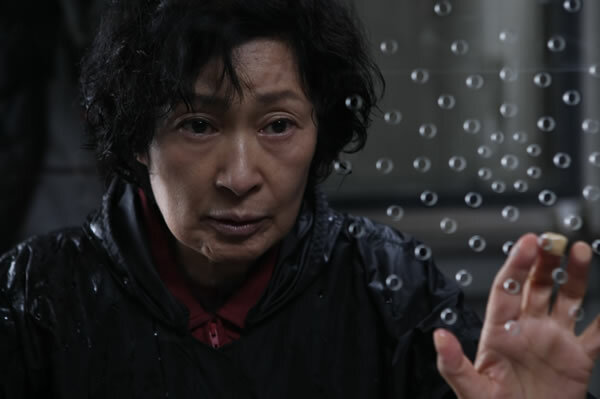 Despite all these absurdities though, it leans more towards melancholic drama, which is a shame because deep within this film is the kernel of a much better existential comedy. Well, maybe not a kernel… more of a chickpea. DVD Extras: Trailers, Soul Extractor concept sketches. 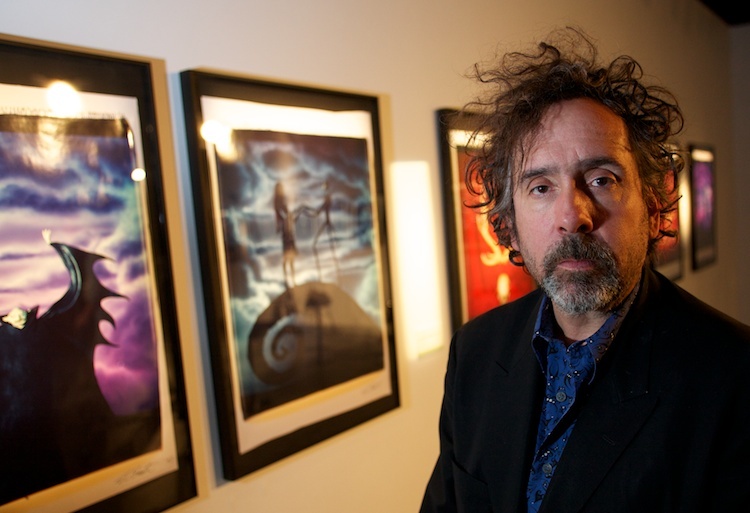 Today saw the unveiling of the latest in the Melbourne Winter Masterpiece series: TIM BURTON THE EXHIBITION at the Australian Centre for the Moving Image and I was lucky enough to be there. The exhibit is made up of over 700 pieces from throughout Burton’s lengthy career, sourced from various private galleries, studio archives and even Burton’s own home. It truly is an intimate look into the mind of a man with a very specific and recognisable artistic vision. 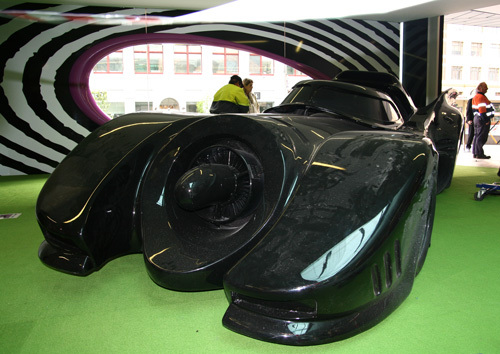 The Batmobile sits in the acmi foyer, guarding the entrance to Gallery 1 (where the exhibit is displayed). It’s appearance is shiny, sleek and polished; three words I wouldn’t use to describe any of the works of art deep within the gallery itself. After walking through the entrance, (a large ghoulish mouth,) a bright red glow lights the stairwell and gives the impression we’re descending into the depths of something sinister. At the bottom, a podium had been erected, presumably for the purposes of the unveiling. It was surrounded by items from one of Burton’s most popular films, EDWARD SCISSORHANDS, including the character’s Gothic outfit, a topiary stag, and one of the actual ‘scissorhands’. It was here that the likes of ACMI Director Tony Sweeney and Museum of Modern Art’s Ron Magliozzi introduced the exhibit and highlighted some of the statistics behind both Burton’s films (ALICE IN WONDERLAND is now the fifth highest grossing film of all time!) and the exhibit’s original run at MoMA in New York (it’s the third most attended retrospective behind only Picasso and Matisse!). Tommy Lee Jones is Louisiana detective Dave Robicheaux, a former-alcoholic searching for a killer wanted for the grisly murders of a couple of young women in Bertrand Tavernier’s atmospheric thriller IN THE ELETRIC MIST. He’s haunted by some things he’s seen, some things he’s done, and the rather talkative ghost of a Confederate General. The film features a terrific supporting cast with John Goodman as the lead suspect, a local crime boss by the name of Babyfeet Balboni. Peter Sarsgaard plays a heavy-drinking Hollywood star who’s shooting a film in the area (that happens to be bankrolled by Balboni) and Kelly McDonald plays his actress girlfriend. The musician Levon Helm (former drummer of The Band) plays the ghost of John Bell Hood, the real-life Civil War General who’s aggression and recklessness has plenty in common with the man he’s haunting/helping. Robicheaux certainly is reckless: slashing tyres, beating information out of suspects and getting answers from the other end of a shotgun, Jones plays him as a man who’s a little fed up with the state of his county post-hurricane, and I don’t just mean it’s appearance. Smooth jazz, beautiful shots of the swamp area and plenty of violence mixed with dodgy police work. A superb thriller that gets nearly everything right.